Sub prime mortgages are experincing a record number of defaults, which is evidenced by the chart above. (Go here to see exactly what the chart represents.) 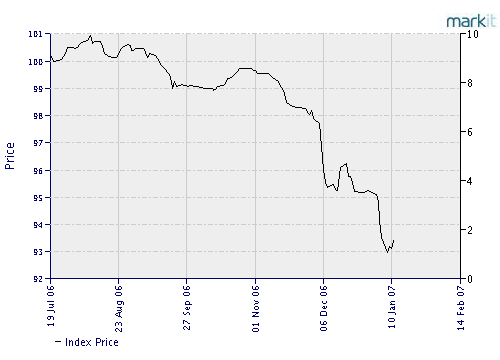 In only the past two days, the index has found another leg down and it does not look like there is a bottom in sight. Lots of the easy money that was lent out the past three years is coming back to haunt the lenders now. This will translate into an increase in foreclosures and bank owned property sales across the country, if it hasn't already. "A huge loss in high-paying private sector jobs in New Jersey could affect home sales along the shore while a corresponding rise in government jobs is also bad for the housing market because it drives up property taxes. Those conclusions come from Jeffrey Otteau, whose Otteau Valuation Group Inc. tracks housing trends for the real estate market. His latest report, the 2007 Real Estate Forecast, contains some dire news about job trends. “New Jersey has added 59,700 jobs since December 2000 of which 53,700 have been government jobs,” Otteau said. The private sector has lost about 120,000 of the higher paying jobs in professional and business services, manufacturing, information and financial employment. From a real estate perspective, Otteau said this job loss equates to 31,000 home sales at $750,000 per house or 23,000 at $1 million per structure." “The shore is at great risk here because it is the higher paying jobs that account for vacation-home purchases. New Jersey is losing these jobs, which will greatly reduce demand for vacation homes. A large portion of housing demand is second-home buyers,” Otteau said. auction in an effort to buy 27 acres of land Edison hopes to preserve as open space. The tract, off of Woodland Avenue in north Edison, was owned by the now-bankrupt Kara Homes, an East Brunswick-based developer that planned to build 22 homes priced from $1.35 million on the property. Kara Homes filed for bankruptcy in October." For all of the REALTOR® talk about the real estate market finding a bottom, I don't see much agreement from home builders. Home builder CEOs in the past week and a half, including Beazer, Centex, Meritage and Ryland are all saying that they don't see a bottom yet. [The company (Centex) also warned the housing market could still be in the early innings of the current slowdown. The MLS for Eastern Monmouth is now at 3852 up from 3777 last week. In the same week last year there were 2975 houses for sale in Eastern Monmouth County. Anecdotally, it looks like many of the houses that were delisted before the holidays seem to be making their way back on to the MLS at lower prices. I bet we get back to the 4000 count by Superbowl Sunday and go into the "spring buying season" with record levels of inventory. OCEAN CITY — Fewer people may be buying a piece of the shore, but more are renting part of it. Real estate businesses are reporting a surge in rentals even as home sales decline along the coast. An increase in rentals as high as 40 percent has been recorded by some real estate companies. Most are seeing a jump in the 10 to 15 percent range. TRENTON — Half of New Jersey consumers expect their household will do the same as or worse financially than last year, and state residents are nearly as bearish about business conditions this year, a survey finds. The fifth annual poll by Fairleigh Dickinson University's Silbermann College of Business finds 47 percent expect business conditions to get worse or stay the same, while only 37 percent expect conditions to improve. The remaining 16 percent were uncertain. A year ago, only 40 percent expected business conditions to get worse or stay the same over the coming 12 months, while 43 percent expected them to improve. Jan. 22, 2007--Standard & Poor's Ratings Services today lowered its rating on class B-2 from ACE Securities Corp. Home Equity Loan Trust Series 2005-SL1 to 'B' from 'BB+' and placed it on CreditWatch with negative implications (see list). 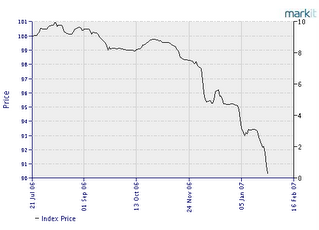 The lowered rating and CreditWatch placement reflect the deteriorating performance of the collateral in the pool. Credit support for this transaction is derived from a combination of subordination, excess interest, and overcollateralization. Credit enhancement is currently projected to fall significantly below the original credit support amount of 13.15%. While actual credit enhancement is 9.74% of the current pool balance, additional losses resulting from foreclosures (approximately $2,682,000) and REOs (approximately $210,000) will likely erode much of the $5,251,200 of overcollateralization. Cumulative losses are $9,075,249 for this transaction, or 3.51% of the original pool balance. As of the December 2006 distribution date, total delinquencies, as a percentage of the current pool principal balance, were 12.65%, and 6.49% were categorized as seriously delinquent (90-plus days, foreclosure, and REO). Hovnanian "the publicly-traded homebuilder that last year moved its corporate headquarters to the heart of Red Bank from Middletown, is scaling back its ambitions in the borough, according to a published report." "Again, I would not join in to the rally at this point, I believe this is a dead cat bounce. Once momentum starts to wane I would look to enter short positions across a basket of these stocks since I believe this downturn has further to go. Absorbtion rates in many towns in the Northeast have more than doubled and I believe there is good potential for more houses to hit the market in the spring. 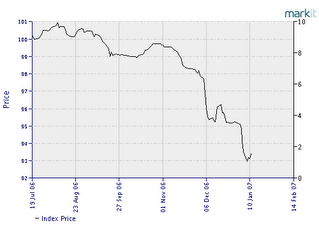 Housing prices have been headed down over the past year and I believe they still have further to drop. The Japanese real estate market took ten years to drop 50% from their highs, and so far, no one has convinced me that it can't happen here. The U.S. housing markets have just had an unprecedented move higher since 1998. I am a firm believer in mean reversion, and unfortunately, when markets overshoot to the upside they oftentimes over correct in the opposite direction as well. All said, I am a housing bear." Full interview with Wayne, a regular Jersey Guy. Would Jean approve of this Wayne? Last week the count was 3749. One thing I've noticed over the past few weeks is a number of furniture companies or stores going under. Nationally, one of the bigger furniture makers to seek chapter 11 proctection recently was Rowe Furniture. Locally though, I noticed that Inspiration Furniture in Manalapan on highway 9 is closing. I once bought a couch from them. TRENTON — A judge today allowed Kara Homes Inc. to replace a $2.6 million loan from an investment bank with one borrowed from a hedge fund, and he will decide later this month whether an additional $2.4 million can go to the beleaguered home builder. Kara will use the $2.6 million to pay off investment bank Bear Stearns and to fund its operations through the end of the month. "Real Estate Will Underperform Inflation for Decades"
"If the last 100 years are any indication of the future, expectations of future price appreciation are not a legitimate reason to buy real estate. A large percentage of the current buyers in the real estate boom of the 2000s are buying based on future price appreciation. Unfortunately, this means that the real estate boom of the 2000s is largely based on a myth. As real estate prices return to levels justified by the legitimate reasons, prices will fall in inflation-adjusted terms. " Full article from Prudent Bear. When I buy my next house, I'm thinking of going straight to the listing agent and not bothering with hiring my own Realtor. Ideally, if the listing agent wants to get a transaction done, they will have room to cut their commission since there won't be a split. What I was also thinking though is maybe hiring a Realtor, but only if they were to change their commission structure. The commission structure that exists now does not work for the buyer because the Realtor's interest is in getting the transaction done at the highest price possible. In order to eliminate this detrimental incentive to the buyer, I propose that the commission for the Realtor representing the buyer be based on a percent discount to the asking price. In short, the higher the discount that the Realtor negotiate, the higher the commission they will receive. I'd like to hear from some Realtors or readers out there if they think this is a good idea. Also, you can post anonymously again (you don't need to sign in or register.) Hopefully the spam will be kept to a minimum. "With home sales down about 20 percent in Monmouth and Ocean counties, real estate agencies are cutting expenses and diversifying their businesses. And as the business gets more competitive, some agents are deciding not to renew their licenses." "Since the industry's revenue comes from commissions, when sales slow down, so does its revenue. To cope, agencies are employing a number of strategies. Some are cutting expenses, while others are actually increasing their marketing and spending more on training. Some agencies are diversifying into other areas of business such as insurance. Individually, some agents have decided to take some time off and are putting their real estate licenses on hold." One of the problems with having too many Realtors is that a delusional house seller can always find a Realtor willing to accept a listing that is obviously too high. I think as the Realtor population declines, the remaining Realtors will be able to walk away from listings that have no chance of being sold because of the price. 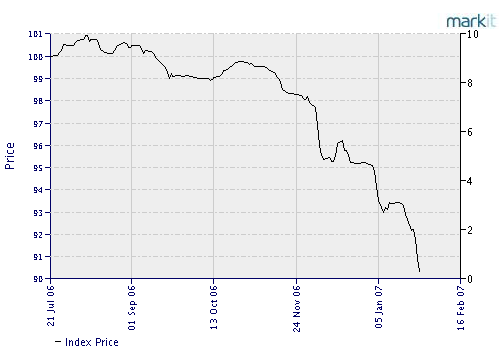 This graph shows the price movement of an index that consists of pools of sub-prime mortages. What is essentially shows is that the market for sub-prime mortages expects a higher rate of defaults. (The lower the price of the index, the less probability 100% of the principal of the mortages will be collected.) If you want a good read as to why this is an ominous sign for the housing market, then read this. Last week the count was 3655. I'm guessing listing are going to shoot past 4,000 after the superbowl. Given all the nice weather we have been having, I think I would list my house now if I planned on selling. The Asbury Park Press has the following text on their website (see below). In classic APP fashion, it does not appear to link to anything. If someone could find the link, please tell me where it is. "What's ailing the real estate market? Are mortgage rates too high? Home prices too high? Buyers fearful of not recouping their investment or not being able to afford a downpayment? Or none of the above? Now is your chance to sound off. Visit our Web site at www.app.com and click on Business to vote. Readers are also invited to email us their comments. " Magyar Bank is publicly traded. Ticker = MGYR. TRENTON — Kara Homes can sell four of its developments at an auction to repay one of its lenders, Magyar Bank, a judge ruled today. The decision by U.S. Bankruptcy Court Judge Michael B. Kaplan could set the stage for another builder to finish homes for 14 buyers who have contracts and already have spent thousands of dollars in down payments. The developments, which include a total of 29 single-family lots, are: Danya Estates in Toms River; Hartley Estates in Little Egg Harbor, Prospect Ridge Estates in Stafford and Sterling Acres in Monroe. Looking at the MLS this morning for Eastern Monmouth County, the number of listings went to 3707 from 3655 on Wednesday. It looks like the end of the year de-lisiting cycle may have ended and people are putting their houses back on the market again after the holidays. Advice for people holding open houses tomorrow; make sure the Jets and Giants games are on. As a matter of fact, instead of tying a stupid baloon to the for sale sign, put up another sign that says, "The Jets or Giants Game is Currently on Inside." CAPE MAY COURT HOUSE — Nearly 30 percent fewer properties were bought and sold in Cape May County last year compared with 2005, confirming a definite cooling in a previously hot housing market. More than 8,300 properties changed hands in 2006, a dip of about 3,500 from the previous year. In Cape May County, the housing market is dominated by people who do not live in the county full time. Use this thread to discuss Kara Homes. Last week there were 3870 listings. 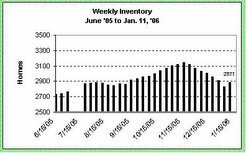 Looking at last year's figures, inventory declined every week between the middle of November and the middle of January. We'll see in a few weeks if the pattern holds this year. "Rising foreclosure rates in New Jersey are likely to remain on the upswing in 2007, but experts say the odds are slim that the increases will signal a crisis for the state’s housing market or its economy. For the first 11 months of 2006, home mortgage foreclosures in the state were 25,472, up 78 percent from 14,311 for all of 2005, according to Foreclosures.com, a real estate advisory firm in Sacramento, Calif.
Big increases occurred throughout the state. In affluent Bergen County, foreclosures jumped more than tenfold, from 104 in 2005 to 1,367 last year. In Monmouth County, home to many shore communities, foreclosures rose from 883 in 2005 to 1,533 last year." CHICAGO (MarketWatch) -- Brian Diez, a former military man, entered the mortgage business after a career as a stockbroker, figuring the field would offer him an altruistic benefit -- helping families buy their first homes. He learned quickly, however, that not every one of his fellow brokers had their clients' best interests at heart. From the Asbury Park Press "Home Sweet Home"
[Despite the recent fluctuations in real estate prices and sale prices that have fallen short of sellers' expectations, homeownership has proved to be a good long-term investment, financial experts agree. Buying a home is the largest investment most people will ever make, said Shrikant Nadkarni, a certified public accountant, certified financial planner and shareholder at WithumSmith+Brown PC's Somerville office.